This topic contains 12 replies, has 3 voices, and was last updated by Yuri Kovelenov 4 months, 2 weeks ago. I have problmes to install the verge add-on, it does not show up in the add-on manager. 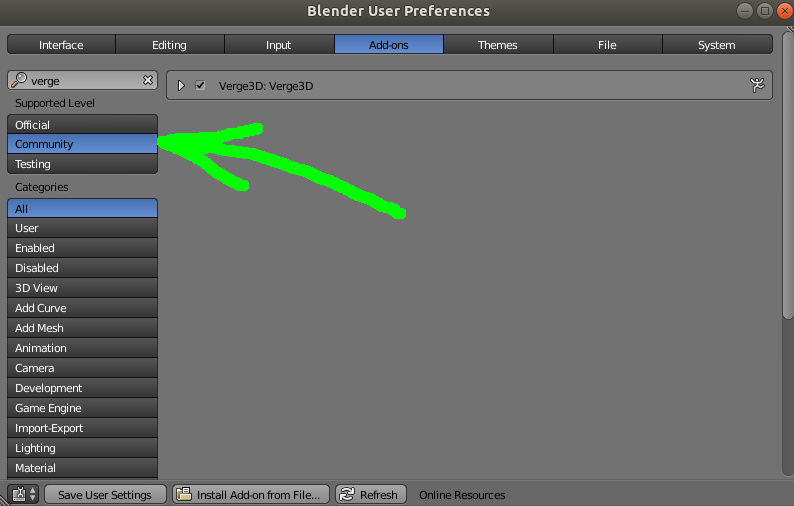 Yes, I filled in the right pass to the verge3d folder in UserPreferences/File/Scripts. I had an older version installed and forgot to uninstall it properly. I just unckecked it in the add-on manager and deleted the folder. Cannot it be that the path is still pointing to the old installation folder? The path I see in UserPreferences/File/Scripts is pointing to the right directory. Can you please check if the Community category is enabled? Because if not the Verge3D add-on will be filtered off. This reply was modified 4 months, 2 weeks ago by Yuri Kovelenov. okay, are there any errors displayed in Blender’s console when you run Blender? I had the same issue. In the drop-down menu in the Info header, Verge3D is not there. I had the Community option checked as well. I like this much more than the previous version. I used to get confused switching between different modes. This reply was modified 4 months, 2 weeks ago by liyao1. Yep, in version 2.9 we decided to drop that Verge3D render mode whatsoever. In the upcoming Blender 2.8 Verge3D will work with both ray-tracing Cycles and real-time Eevee render engines. The old Internal render engine of Blender 2.7, on which the early Verge3D was based on, has become obsolete. We’ll update all our docs and video tutorials to reflect that fact. Thanks! I did a new verge download and unziped it next to the first try. And now all works how it should. I compared the two verge folders (first ans second download) and in the first one there a files missing in ./verge3d/addons. Don´t know why, can not find them in the trashbin, perhaps the unzip was currupted. Thanks all for your help and effort. I understood that the Internal Blender Render is not good. What are the major differences between PBR materials, Cycles materials, and the upcoming Eevee materials? Do they behave differently in different scenarios or are they interchangeable? I know that we have to use PBR material to post on FB. But besides that, is there any advantage of PBR materials? 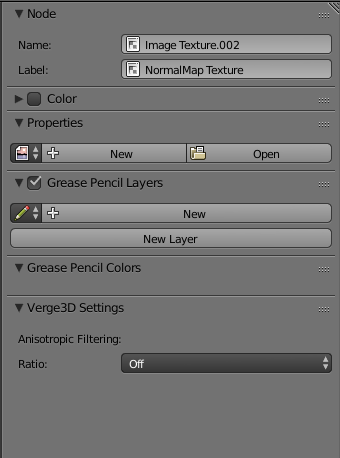 Also, I think there is a typo in the NormalMap texture node in the stock Verge3D PBR material……in the attached screenshot. Or is it called NormapMap??? What are the major differences between PBR materials, Cycles materials, and the upcoming Eevee materials? Do they behave differently in different scenarios or are they interchangeable? The glTF-compliant PBR materials are simpler but not that flexible. They are of use is there is a need to load your scenes in some software or viewer that requires strict glTF format, such as Facebook 3D Posts. Cycles and Eevee nodes are mostly interchangeable. They allow you to create PBR materials of any complexity and even mix PBR shaders with each other. If you are already using Blender 2.8, you might want to use Eevee. In Blender 2.7, Cycles is the only game in town, because Internal GLSL materials are now obsolete. Good catch! We’ll fix this typo. You can also change the texture name yourself in its settings.